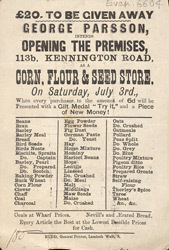 The most common type of shop in the 19th century was the provision store or the general grocers. It catered for the general needs of the working and lower middle classes. Typically they sold the staples of tea leaves, coffee beans, sugar, flour, cheese and sometimes meat like bacon. Grocer’s shops usually worked on the basis of credit and this meant that members of the working classes could also afford to shop in these stores as they could pay off their debts when they could.